By DAMIEN CAVE.August 2, 2011. In Havana on Saturday, Cubans looked at notices for apartment exchanges. Cuba is about to legalize the sale of property. But when Cuba legalizes buying and selling by the end of the year — as the government promised again this week — José and many others expect a cascade of changes: higher prices, mass relocation, property taxes and a flood of money from Cubans in the United States and around the world. Private property is the nucleus of capitalism, of course, so the plan to legitimize it here in a country of slogans like “socialism or death” strikes many Cubans as jaw-dropping. Indeed, most people expect onerous regulations and already, the plan outlined by the state media would suppress the market by limiting Cubans to one home or apartment and requiring full-time residency. Yet even with some state control, experts say, property sales could transform Cuba more than any of the economic reforms announced by President Raúl Castro’s government, some of which were outlined in the National Assembly on Monday. Compared with the changes already passed (more self-employment and cell-phone ownership), or proposed (car sales and looser emigration rules), “nothing is as big as this,” said Philip Peters, an analyst with the Lexington Institute. The opportunities for profits and loans would be far larger than what Cuba’s small businesses offer, experts say, potentially creating the disparities of wealth that have accompanied property ownership in places like Eastern Europe and China. Broader effects could follow. Sales would encourage much-needed renovation, creating jobs. Banking would expand because, under newly announced rules, payments would come from buyers’ accounts. Meanwhile, the government, which owns all property now, would hand over homes and apartments to their occupants in exchange for taxes on sales — impossible in the current swapping market where money passes under the table. And then there is the role of Cuban emigrants. While the plan seems to prohibit foreign ownership, Cuban-Americans could take advantage of Obama administration rules letting them send as much money as they like to relatives on the island, fueling purchases and giving them a stake in Cuba’s economic success. “That is politically an extremely powerful development,” Mr. Peters said, arguing that it could spur policy changes by both nations. The rate of change, however, will likely depend on complications peculiar to Cuba. The so-called Pearl of the Antilles struggled with poor housing even before the 1959 Revolution, but deterioration, rigid rules and creative work-arounds have created today’s warren of oddities. There are no vacancies in Havana, Mr. Coyula pointed out. Every dwelling has someone living in it. Most Cubans are essentially stuck where they are. On the waterfront of central Havana, children peek out from buildings that should be condemned, with a third of the facade missing. Blocks inland, Cubans like Elena Acea, 40, have subdivided apartments to Alice in Wonderland proportions. Her two-bedroom is now a four-bedroom, with a plywood mezzanine where two stepsons live one atop the other, barely able to stand in their own rooms. But despite reassurances — on Monday, Marino Murillo, a top official on economic policy, said selling would not need prior government approval — Ms. Acea and many neighbors seemed wary of the government’s promise to let go. 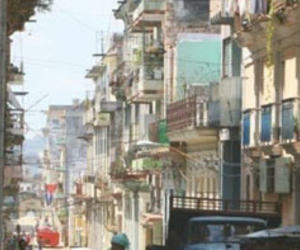 Some Cubans expect rules forcing buyers to hold properties for five or 10 years. Others say the government will make it hard to take profits off the island, through exorbitant taxes or limits on currency exchange. Still more, like Ernesto Benítez, 37, an artist, cannot imagine a real open market. “They’re going to set one price, per square foot, and that’s it,” he said. Of course, he added, Cubans would respond by setting their own prices. And that might be enough to stimulate movement, he said. He certainly hopes so. Mr. Benítez and the woman he has lived with for nearly a decade broke up 18 months ago. Each is now dating someone new and there are nights, they admit, that get a little awkward. Only a narrow bathroom separates their bedrooms. In Miami, a similar apartment might cost nearly 10 times that — which is what many Cuban-Americans seem to be thinking. José and several other brokers in Havana said real estate transactions on the black market routinely involved money from Cubans overseas, especially Florida. Technically, this is a violation of the trade embargo that began under President Dwight D. Eisenhower. According to the United States Treasury Department, deals or investments with Cubans are prohibited. Receiving money or profit from Cuba is also illegal. But the rules are muddy in practice. Family transactions — mainly involving recent emigrants — seem to be expanding with a wink from the White House. Supporting private business is now encouraged under the general license that lets Cuban-Americans visit relatives, and in 2009, President Obama established a new policy letting Cuban-Americans visit the island whenever they want, and send unlimited remittances to relatives. Beyond that, enforcement against individuals, as opposed to businesses, is practically nonexistent: in the past 18 months, only one American was penalized for violating the sanctions, with a fine of $525, according to a Congressional report published last month. Experts say the Cuban diaspora has already begun to create a tiered social system in Cuba. Cuban emigrants sent back about $1 billion in remittances last year, studies show, with an increasing proportion of that money financing budding capitalists in need of pizza ovens or other equipment to work privately. Homes would simply expand the bond, experts say, and offers are already arriving. Ilda, 69, lives alone in a five-bedroom, ninth-floor apartment with views of the sea. A visiting Cuban-American couple — “chic, very well dressed,” she said — asked to buy her apartment for $150,000, with little care for any bans on foreign ownership. “I told them I can’t,” Ilda said. “We’re waiting for the law.” Even when the law changes, she said she would prefer a “permuta,” a trade, because she would be guaranteed a place to live. Her fear of having nowhere to go is common. One recent study, by Sergio Díaz-Briquets, a Washington-based demography expert, found that Cuba has a housing deficit of 1.6 million units. The government says the number is closer to 500,000, still a serious problem. Mr. Coyula said money from sales might not be enough to fix it, since there is almost no construction industry, permitting process or materials to build with. For now, though, Cubans are trying to grasp basic details. How will the mortgage system work? How high will taxes be? What’s a fair price? There is even a question of how buyers and sellers will come together. Classified listings are illegal in Cuba, which explains why brokers like José, known as corredores, spend their days moving through open air bazaars with notebooks listing apartments offered or desired.